Accompanying this record is a tale of tragedy. After long searching far and wide for an original Victor issue of Fletcher Henderson’s “Variety Stomp”, I was thrilled when a promising copy turned up on eBay, and I was able to win for an excellent price. When the record was finally delivered, I opened the package to discover in horror that it was woefully insufficient to protect the contents from careless postal workers, and what would have been a nice V+ record was snapped in two pieces, just about through the middle. The seller very kindly refunded the cost, and the record sat dejectedly for months on my broken record pile. It wasn’t doing any good just sitting there, so eventually I decided to try my hand at repairing it, and with the remains of Victor 20944 and a tube of superglue, I carefully lined up the two halves of the record, and put a dollop of glue on the outside edges, and in the runout area on both sides. After the glue dried came the moment of truth, I brought the repaired record to my turntable and to my surprise and relief, it tracked perfectly, and played through with only two surprisingly minor background clicks. I have since acquired Henderson’s Bluebird issue of take 2 of “Variety”, and his acoustical recording on Harmony, but my heart still yearns for a better copy of this record. Maybe someday. Below, you can hear the results of my efforts, straight from the turntable, with no cleaning up or modification of any sort to the audio. Victor 20944 was recorded April 27, 1927 at the Victor studios in New York City, and released in November of ’27. Besides Henderson on piano and directing, the all-star lineup includes Joe and Russell Smith, and possibly Tommy Ladnier on trumpet, Benny Morton and Jimmy Harrison on trombones, Buster Bailey and Don Redman on clarinet and alto sax, Coleman Hawkins playing his famous tenor sax, Charlie Dixon on banjo, and June Cole and Kaiser Marshall on tuba and drums, respectively. On “A”, Henderson’s Orchestra plays hot on “St. Louis Shuffle” (take 2), composed by Jack Pettis and Thomas “Fats” Waller. 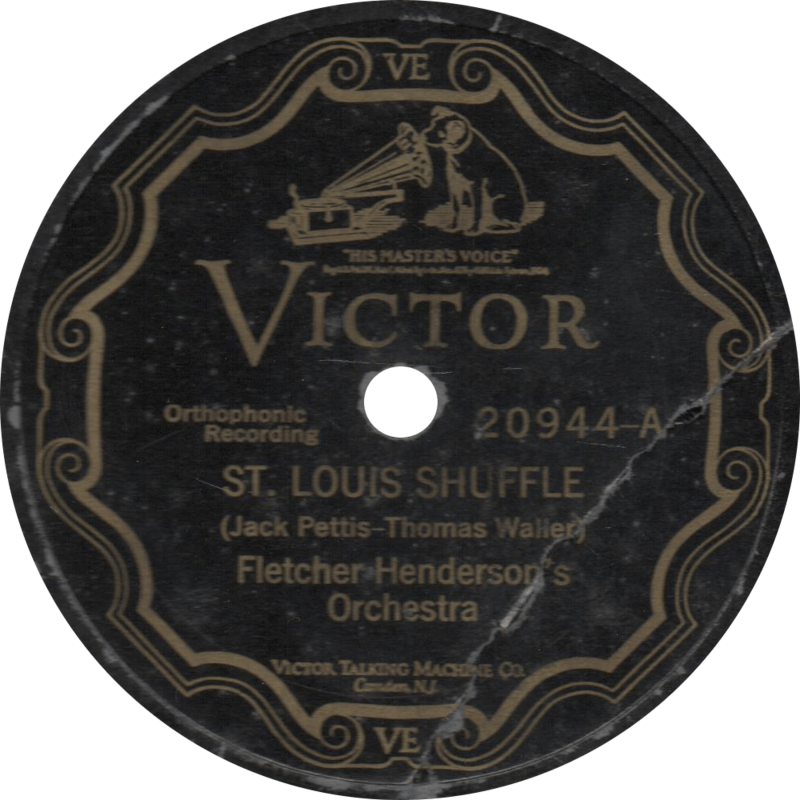 St. Louis Shuffle, recorded April 27, 1927 by Fletcher Henderson’s Orchestra. On “B”, they play one of my favorites, take 3 of “Variety Stomp”, which was only issued here, composed by Jo Trent, Ray Henderson, and Bud Green. 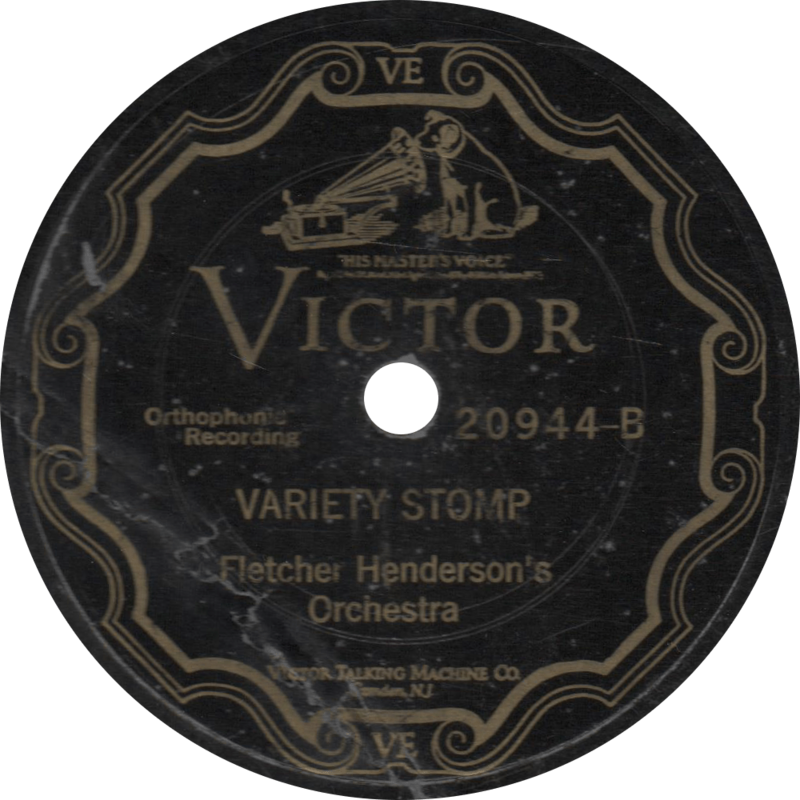 Variety Stomp, recorded April 27, 1927 by Fletcher Henderson’s Orchestra. I don’t think it sounds too bad for a record that was broken in half, myself! This entry was posted in Records and tagged 1920s, 1927, Benny Morton, Buster Bailey, Charlie Dixon, Coleman Hawkins, Don Redman, Fats Waller, Fletcher Henderson, Harlem, Jack Pettis, Jazz, Jimmy Harrison, Jo Trent, Joe Smith, June Cole, Kaiser Marshall, New York, Ray Henderson, Russell Smith, Tommy Ladnier, Victor by R. Connor Montgomery. Bookmark the permalink.